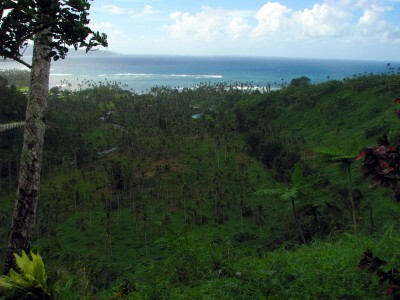 July 24, 2010, filed under Fiji; No Comments. 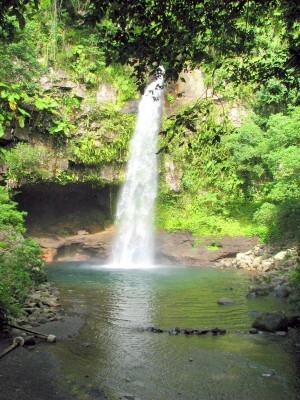 We decided to see the waterfalls made famous by the movie “Return to the Blue Lagoon” at Bouma National Park. We arranged for a taxi to pick us up from Bibi’s at 8:30 so we could arrive early and beat the crowds. Although, we were the first people there I don’t think there were any crowds to beat. When we left at noon there were only a handful of people there. 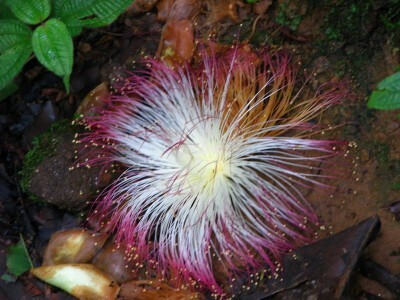 Bouma National Park is about an hour North of Bibi’s Hideaway. It probably isn’t that far away, but the bumpy dirt road requires slow driving. The drive is pretty, parts of it offer great views of the coast and you also pass a small village where I was surprised to see women doing their wash in the stream. The entry fee to the park is $15 FJD and the taxi to and from was $60. The lady at the desk drew us a map of the waterfalls. The map isn’t essential but it is nice to have. Also, the bathrooms at the information desk are the only ones in the park. 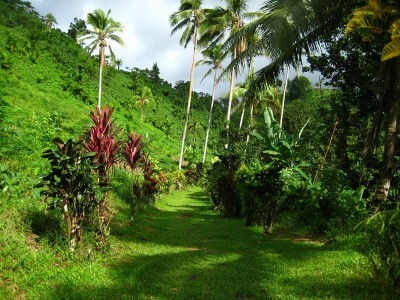 The carefully manicured path to the first waterfall is a testament to how much the locals value the tourists. Don’t be fooled by the flat, easy walk, as the hikes to the second and third waterfalls become progressively more rugged. The first waterfall is something out of a fairy tale. There is a gentle sloping sandy beach entrance, so you can comfortable wade into the water. The falls juts far from the cliff like a manmade fountain. If you are a strong swimmer you can swim all the way to the falls and even behind it. There is a very strong current pushing you away from the center of the falls and the constant spray of water in your face makes it difficult to get a good gulp of air as you approach the rushing water. I almost made it to the center, and it was as wonderful as I imagined. The water feels like a warm rain. 1. 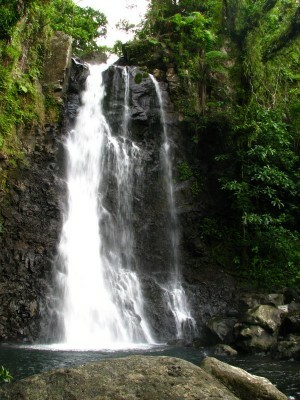 Dress for swimming in the first falls, but bring tennis shoes or hiking shoes for the rest of the trip. There is a changing room by the first falls so you can remove your wet swimsuit. 2. To get past the second waterfall you have to walk through the water, reef walkers would be ideal, but I just went bare-foot then put my shoes back on the other side. 4. The second waterfall has a picnic table, perfect for lunch. After a couple attempts to make it to the center of the falls I was exhausted and had trouble with the steep climb to the next falls. Fortunately there were some benches about half-way up the hike, so after a moments rest I was ready for the rest of the climb. The coolest lizards, skinks maybe, ran all over the stairs to the second falls. 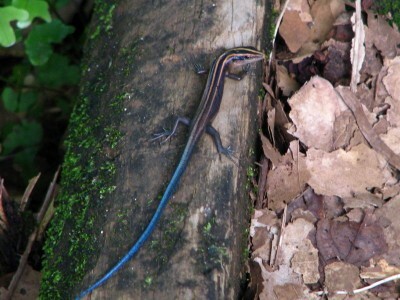 At first glance they just look like the shiny skinks we have back home, but then I noticed they had bright, blue tails. They were so fast it made getting a clear photograph impossible, but Paul managed to get some decent shots. The hike is probably the most beautiful I’ve even been on. 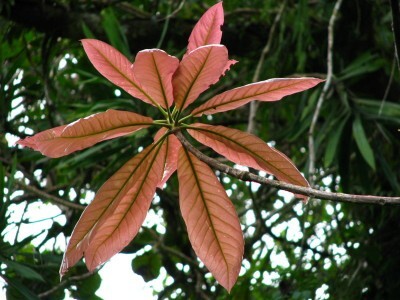 The lush, tropical foliage, with bright flowers was stunning. There is the most amazing view of the ocean, with a field of palm trees in front of the water, and then the wildlife – we saw huge parrots. They had blue and green wings with red chest. Listen for their loud squawk, and then look for movement in the tree tops! 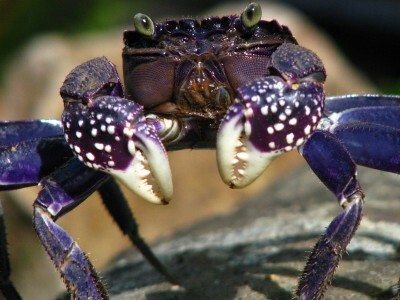 As we approached the river crossing a bright-purple crab stood in the middle of the path, waving is claws menacingly if we tried to hop over him. I was a little nervous to jump over the large snappers, so we tried scaring him off by waving sticks and throwing leaves in his direction. The crab would not budge! He would grab and shake the leaves that flew too close to his outstretched claws. He looked like a goalie refusing to let anything by. Eventually I lost the battle of wills and took a running leap. After landing, without pinched toes, I turned to watch Paul do the same. Surprisingly, the crab stretched his claws as high as they would go and snapped at Paul’s feet. They weren’t anywhere close, but it was clear that this crab meant business. There were a few more of the purple guardians on the path, but none were as menacing as the first. They all guarded their territory fiercely, forcing us to jump over them. We were only able to scare one off to the side, but as we hurried past he leapt toward us with his pinchers ready! Any time the path split we went left. There is a river crossing where your only bridge is a rope to hold onto and boulders to jump. The path from the second waterfall can be difficult to see – walk on the rocks to the front of the waterfall, there is a path to the right of the falls, look for the sign. You must take off your shoes and cross the river to get to the path. On the way back from the third falls, take the small bridge on the left and you’ll bypass the 2nd waterfall and take a jungle stroll instead. 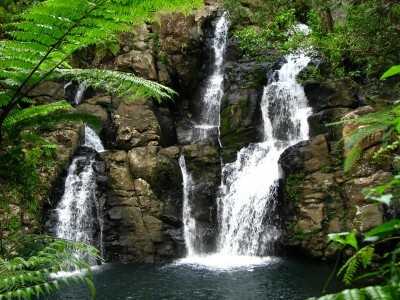 We only swam in the first waterfall, but I guess you could take a dip in the other two. Neither one of the others has a nice sandy beach entrance, so you would have to maneuver around the boulders, probably manageable if you have reef walkers. The entire hike took us four hours, but you could certainly do it faster if you were pressed for time. We took time to swim, eat and enjoy the scenery – taking many stops for pictures and crab encounters! While the first waterfall seemed like something from a fairy tale, the last waterfall looks like something from an adventure magazine. This falls is close the rocky cliff creating lots of small splashes instead of the smooth flow the first waterfall. If splits off at the top forming two separate falls and there is a large pool in the center of the cliff, which makes one of the falls actually two shorter cascades. There are so many fantastic angles to get a great shot, plan on spending a lot of time at this waterfall. , filed under New Zealand; No Comments. We had a fantastic time and I am so happy we decided to go on this trip. Not only do we have beautiful memories of all the places we saw, but we shared the amazing experience and our marriage will be stronger because of it. If you are thinking of taking a long trip – do it! Don’t worry about all the reasons not to go – just go! June 14, 2010, filed under Fiji; 2 Comments. There isn’t any way to hang your clothes, except outside on the clothes line, so plan accordingly. There are dressers to put your clothes away, but if you were planning on letting the wrinkles fall out of a dress you’ll have to rig something. You could bring wire hangers and bend them to fit into some crack in the bamboo. 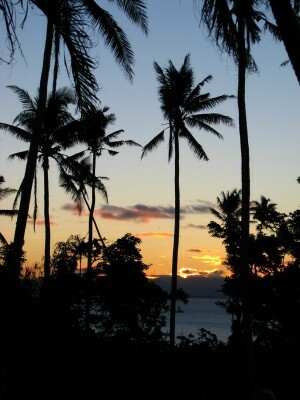 Write down the high and low tides for each day before you arrive, so you can plan your snorkel trips accordingly. You want to go out just before high tide and return not to long after hide tide so you don’t get stuck or end up with coral scratches on your belly. Bring soap and shampoo. The bures come with toilet paper, tea, coffee, powdered creamer and sugar, but no toiletries you would expect at a typical hotel. The fridge is gas powered so it runs 24 hours a day. 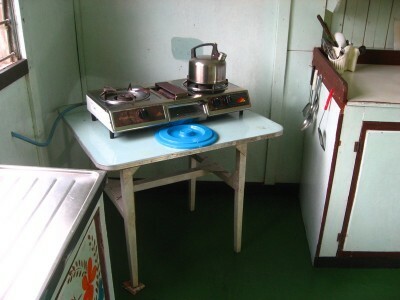 You also have a gas stovetop for cooking. Bring mosquito repellent. There are screens on the windows, which helps greatly, but there must be holes. Bibi’s does provide a few mozzi-repelling incense things. Bring your own snorkel gear, (mask, fin, snorkel) so you can snorkel for free at the beach down the hill. Plan on walking a lot – so get very comfortable flip-flops. I find the cloth Reefs wonderful, but try walking for 30 minutes in yours before coming. The plastic ones will not do. Bring plenty of cash, few places take credit and they charge an extra 5%. If you don’t want dogs hanging out around your bure, tell them to ‘go home’ from the very beginning. The tangerines are still sweet even when they are green. If you can’t find any ripe fruit, pick it while it is green and leave in on the counter for 1-3 days. You may be pleasantly surprised! Don’t forget to charge batteries for your camera, or whatever, between 6-9. There are a couple stores nearby. The closest is next door, but has a limited selection. The next is to the right it is a few minutes past Coconut Grove and they sell alcohol and beer. The largest is a few minutes farther down the road, past the pretty beach, is the largest grocery store. Don’t expect a supermarket, but you can get some nice Indian soups that go great with rice. Also, there are always taxis around the last store, so stock up and then take a taxi home for $3 Fijian. Taxi from the airport is only $2 Fijian. 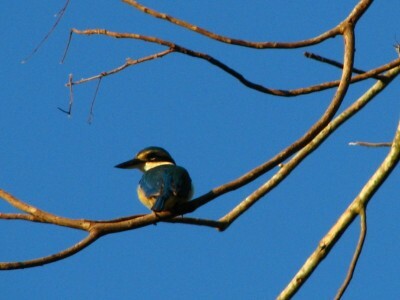 Early mornings and evenings are great for bird watching on the property. We didn’t see the famous orange dove, but we saw a large Fiji Goshawk just outside our room. The little blue bird photographed above was always around, along with little green birds. The public beach is to the left of Bibi’s. It is not just across the street, but a couple minutes walk down the hill. You’ll pass a couple private beaches and then see a red bridge which crosses to the beach. If you reach the dive shop you went too far, but they allow you to swim there also. Prince Charles is a little farther down, just pass Tramonto Restaurant. The snorkeling is a little better at Prince Charles, but it isn’t that great – maybe because of Hurricane damage. If you haven’t had amazing snorkeling before you’ll love it. Lots of fish, but the coral is damaged. Bibi’s is a great place to stay, but don’t expect the amenities of a resort. Paulina and Jim are very friendly and helpful, but you should do your research before you come. Keep a list of things you want to see – all the taxi drivers know where everything is located. Don’t plan on walking to a hotel lobby and having someone suggest a day’s activities. 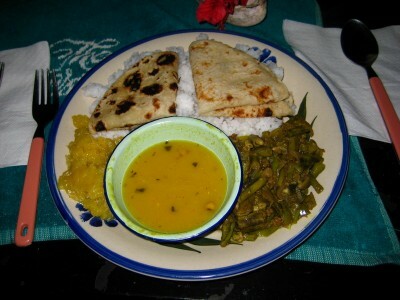 The neighbor next door (before the store) provides Indian food for $10 Fijian or a Fijian Lovo for $15. It is great and is delivered to your door! Just ask for it sometime during the day. Taxi prices vary, we were charged $70 Fijian to get to Bouma Park and back. The driver waited for us, so we didn’t have to worry about setting a return time. 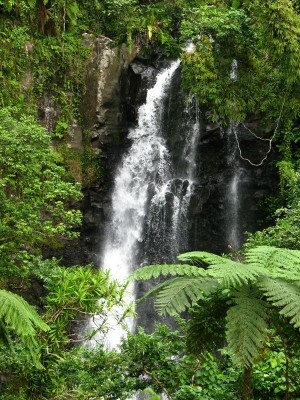 The coastal walk and triple waterfall hike were the same price. It is $40 to get to the water slides. This may sound like a list of reasons not to stay at Bibi’s – but I loved it! I just want to pass some information along. Paulina and Jim are very nice and helpful. 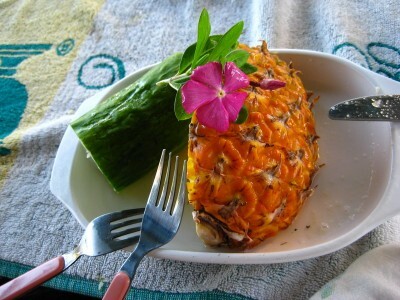 They even brought us fresh pineapple one morning. I loved the privacy of the bure and not having to talk to someone in a hotel lobby every morning. We could go days without talking to Paulina or we could join her for a cup of tea. 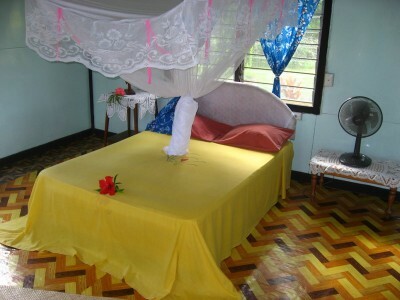 For more, check out this Bibi’s Hideaway Photo Gallery page.